Matthews Wall Anchor offers pile foundations for commercial structures in Pittsburgh. This type of deep foundation is built on piles and columns that support buildings on the ground. Since pile foundations are complex, they require a foundation engineer for installation. Pile foundations are driven into the soil with a pile driver until the desired depth is reached. As the piles reach the more suitable soil, the load is transferred to the soil through end bearing and skin friction. 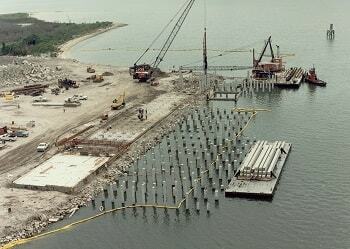 Pile foundations are often used in marine constructions for oil rigs, piers, bridges and docks. They can also be applied to poor soil conditions that can not support foundation designs or heavy loads for traditional construction. For heavy commercial buildings in the Pittsburgh, PA area, we offer pile foundations. Our highly skilled team, including structural contractors, are trained to ensure proper installation so your building will last for many years to come. Contact Matthews Wall Anchor today for an estimate.